Microbial communities (known as “microbiomes”) greatly impact our ecosystem and health. Chase Donnelly, a student in NSU’s M.S. 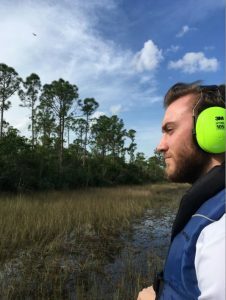 in Marine Biology program, is studying anthropomorphic influences on the microbiomes in South Florida’s aquatic ecosystems as part of his thesis project. In support of this research, Donnelly recently received a Batchelor Foundation Scholarship, which provides an annual stipend. Donnelly’s study will characterize the microbiome of the South Florida canal system built by the Army Corp of Engineers and Grassy Waters Nature Preserve in Palm Beach County. Samples from carefully chosen natural, urban, and agricultural areas will be obtained and compared. This project also supports the broader research goals of Donnelly’s faculty mentor, Jose Lopez, Ph.D., professor at NSU’s Halmos College of Natural Sciences and Oceanography, whose lab applies modern molecular genetics methods to better understanding the dynamics and impacts of microbiomes and invertebrates on local habitats (coral reefs, inlets, and watersheds). The South Florida canal system was put in place during the 1950s to 1970s and is used by the South Florida Water Management District to control water levels throughout the state, providing flood control and water supply from Lake Okeechobee to the Everglades and leads into several estuarine and marine environments on the Atlantic and Gulf of Mexico coasts. These sites are being used to determine how urban and agricultural areas are influencing the water that is being shuttled from inland out to sea, where these areas may be affecting ocean coral systems. This research also studies at Grassy Waters Preserve, a highly regulated and controlled natural wetland in Palm Beach County. Grassy Waters serves as a natural control environment that is rainfall-fed. The city of West Palm Beach and Palm Beach depend on this preserve for much of their drinking water. Grassy Waters will be used to compare the effects of urban and agricultural runoff on microbial community composition. Working with Patrick Painter, Environmental Resources Manager for the city, Donnelly will sample the northern section of the preserve monthly, collecting water and soil samples. The results of the research will hopefully reflect the importance of monitoring and protecting areas such as Grassy Waters. Naomi D’Alessio, Ph.D., assistant professor at the Halmos College and a board member with the nonprofit Grassy Waters Conservancy, helped Donnelly secure a grant from the conservancy to partially fund the project. Funds from the grant will be used to run next-generation sequencing techniques that allow for community composition of bacteria in the samples Donnelly collects. Article originally posted on SharkFins Weekly NSU Student E-newsletter website. Click here to view the article.